On the eve of the Twins’ opener in Canada, manager Ron Gardenhire resolved perhaps the biggest indecision of spring camp with his announcement that he will split time between Joe Nathan and Matt Capps in the closer role. Even though he made significant strides in his first time back on the mound competitively, Nathan still was struggling with his slider and the fastball did not have the same pop as it did two years ago. Reaching this verdict to split time was likely even easier when comparing the two relievers’ spring results. While Capps finished the spring throwing 10 innings while whiffing nine and not allowing a walk, Nathan rarely missed bats as he walked four and striking out just three in his eight innings of work. "I'm just fine-tuning my slider, which is a big pitch. It's one of those pitches that seems to come later in the spring for me. So it's something I'll have to touch up and stay on top of, because it's a big pitch for me." Just how big of a pitch was Nathan’s slider when he was healthy? According to Inside Edge's data, from 2007 to 2009, opponents managed to hit just .163/.205/.234 (AVG/OBP/SLG) off of his slider. Twins infielders would regularly get a quick breeze in their directions as opponents swung-and-missed a whopping 40.8 percent of the time when taking a cut. For Nathan, his slider was his go-to out-pitch racking up 122 of his 242 strikeouts on it. When hitters did make contact, the slider was typically kept on the ground – a stark contrast to his fastball which they tended to elevate. Speaking of the fastball, as important as the slider is to his dominance, there is the growing concern that he has not yet regained the velocity necessary in order to set up the slider effectively. After a month of being reminded constantly not to fret over his fastball’s velocity – that he ramps up towards the end of spring training - Nathan took the mound in Atlanta for the exhibition game on Wednesday for his final showing before the regular season. Deep in the dirty south, he was still chucking unleaded gas. Unlike his previous outings in the Grapefruit League, Turner Field provides us with access to his stuff through the pitch f/x system and allows for a strikingly accurate velocity reading. Is this something to be concerned over? Over at Baseball Prospectus, Mike Fast’s research shows that most pitchers’ velocity has quite the bell-curve throughout the duration of the season. Many start at a lower level then peak as the temperature warms up before descending again in the fall. Like most of his hurling brethren, Nathan shares this trait. Dating back to 2005, Fangraphs.com data says Nathan enters the season’s opening month tossing up 94.4 mile per hour cheddar at hitters. This too has increased as the season progressed. So it’s entirely possible that he will ramp up his heat as the 2011 season ages but even still, a four mile per hour decrease is hard to recover over seven months. Likewise, it should be emphasized that for most Tommy John veterans velocity does not levy nearly the same amount of focus as their control does. After all, an 87 miles per hour fastball can be just as effective as a 96 mile per hour one if spotted correctly. For the most part, the issue is that the elbow is an instrument of command (whereas the shoulder is the driving force) so as pitchers re-acclimate themselves to their newly repaired elbow it’s often the control that is the last facet of pitching to return. So if the velocity does not make an immediate return and pitches are left up in the zone, they have a nasty habit of getting lost in the bleachers. This fastball location was particularly effective considering Nathan supplemented this with a slider thrown low in the zone. This combination would give hitters a large swath of the zone to patrol. 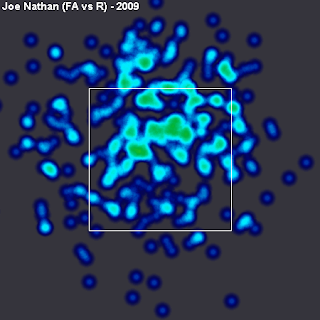 However, at his current velocity levels, Nathan might experience more damage if he continues to throw his fastball at those areas. According to John Walsh's research at the Hardball Times, pitchers with velocity in the 88-to-91 mile per hour range gave up far more runs on pitches up in the zone versus those in the same speed range who kept the ball down. So if Nathan in unable to increase his velocity during the regular season when his adreneline is flowing, he will need to keep the pitch down in the zone. Furthermore, consideration must be paid to the fact that Nathan is returning from a major surgical procedure and attempting to do so just 12 months after his date with the knife. When closer Billy Wagner returned to action just 11 months after his Tommy John surgery,multiple major-league sources warned him that the medical risk persists for a pitcher until he is at least 14 months removed from the procedure. For Nathan, that 14-month milestone comes at the end of May. To make matters worse, he will be asked to pitch in Minnesota when the chilly spring weather takes a toll on healthy arms, so it shouldn’t surprise anyone to see Nathan’s recovering elbow experience a setback or hear reports of tightness after some outings. Given his early returns, the troubles finding his slider and the disconcerting drop in velocity on his fastball, it is not unreasonable to expect Nathan to encounter some rough outings in the early going. That said, the decision to split the end of the game between Nathan and Capps is a sound one. Not only does it give Nathan the time to refine his pitches both in game and in bullpen, it also gives him the necessary time between outings to recoup - especially when the elements are less than favorable in the spring. Regardless of whom Gardenhire ultimately selects to achieve the overhyped statistic of the save, having Nathan healthy and available throughout the season should improve the bullpen, even if he does not regain his pre-injury form.